« Taking “Garden to Plate” With Salsa! August 25, 2014 by Cheryl Barber Spires, R.D., L.D. Weight is a topic that gets discussed from the moment we are born. “You just had a baby girl? How much did she weigh?” While we are young, we happily get on the scales and announce that we have gained a couple more pounds. Weight determines which car seat an infant or toddler or young child needs to be safe while riding in a vehicle. Weight is documented on a chart each time we visit the Dr.’s office. It seems though, that as we grow older, we feel more insecure about our weight. Most likely we are comparing ourselves to all of our friends and acquaintances thinking more about our body size, shape, and overall appearance rather than our weight. I find that looking in a mirror, I feel pretty good, but when I see myself in pictures I am very self-conscious that I am “bigger” than I thought. Weight seems to creep up slowly for many over the years, and as we age it is more difficult to lose. Our metabolism slows down. We sit more than we did as youth and young adults. We are eating on the run and indulging in treats more often. So, what should we, as adults, do to equip ourselves with the best plan for living a healthy life? We should not avoid the scales, but we should not overdo either. It is best to weigh yourself once a week at the same time. This will give you the best comparison. Once you know your weight and height, you can calculate your BMI (Body Mass Index). To calculate your BMI the formula is: weight (lb) / [height (in)]2 x 703. You may also use this BMI Calculator from the CDC (Centers for Disease Control). We need to also evaluate our Waist Circumference. A BMI alone may not give us a full picture. For example, persons with high muscle mass will often have a high BMI when they are actually very fit and healthy. While standing, use a flexible tape measure to find your waist circumference just above your hip bones. 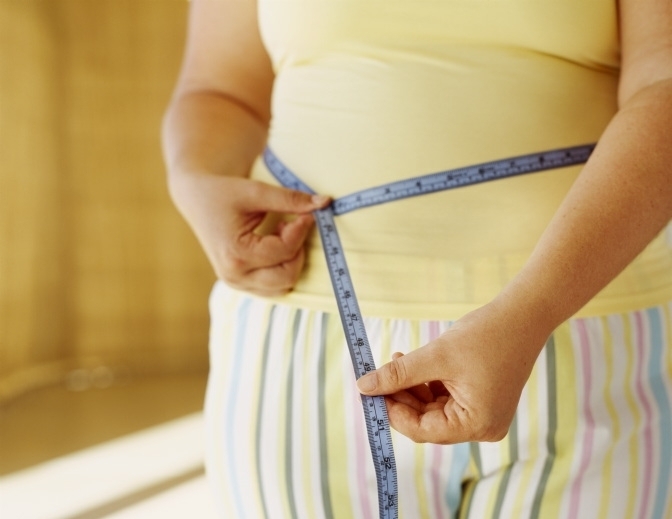 For women, a waist above 35 inches may indicate additional health risks. For men, a waist circumference above 40 inches may be of concern. Finally, we want to think about other risks such as family history, tobacco use, an inactive lifestyle, men over the age of 45 and women who have gone through menopause, and having already been diagnosed with high blood pressure, diabetes, or some other chronic disease. Weight is just one indicator of our health and it is one many of us struggle with maintaining in a healthy range, but it is one worth tracking. Decreasing our body weight by just 5 – 10% can greatly reduce our risk of health problems. My husband has been working hard to lose some weight and eat healthier. I am consuming more vegetables and increasing my activity. When we support one another in our healthful adventures, it is more fun and the results are greater. What are you doing to reach and maintain a healthy weight? Let’s get started! Sources: Centers for Disease Control and Prevention. Healthy Weight – it’s not a diet, it’s a lifestyle! 16 July 2014. Web. U.S. Department of Agriculture and U.S. Department of Health and Human Services. “Dietary Guidelines for Americans 2010.” 2010. http://www.dietaryguidelines.gov. Web.